After going through a large group of dog food recipes and omitting any with ingredients that may be hard to obtain (spices, specific cuts of meat and fish, etc) or include onions and other ingredients that we know are not good for dogs to eat, we've come up with the following selection of meaty dog treat recipes to share with your favorite canines. Please be aware that several of these recipes will make large batches of food. You might wish to cut the dog food recipes or freeze them for later use. Liquefy liver in blender, add dry ingredients. Grease cookie sheet. Drop teaspoonfuls of doggie treat mixture onto cookie sheet and flatten with bottom of glass dipped in water and cornmeal. 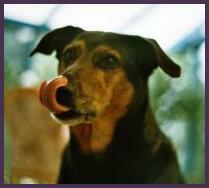 Let liver dog treats cool before serving to your dog. You can store baked or unbaked treat dough in freezer. Unless you are cooking for 6 large dogs, like the creator of this recipe, you might wish to cut the ingredients by as much as a quarter. Read the whole recipe before beginning. Line 2 jellyroll pans (these are larger than cookie sheets and have 1 inch sides) with wax paper, cut to fit the bottom only. Place the wax paper in the pan & then spray the wax paper with a cooking spray. Set aside & prepare dough. Dissolve the bouillon in the hot water & set aside. Process the liver until it is mush (or chop very, very finely). Put the liver mush in a LARGE bowl and add the beaten eggs, garlic powder and dissolved bouillon. Stir this mixture until well blended. If you add the flour/oatmeal all at once, the mixture may ball up into a lump! After the whole glop is thoroughly mixed, spread it out evenly into the prepared jelly roll pans. Bake for 25 to 30 minutes or till baked clear through to the center. Let the baked doggie goodies cool in the pan a bit, then loosen the dough around the edges, turn the pan upside down onto a bread board, remove the wax paper, and cut into bait-sized squares. I then place the cookies into zip-lock storage bags and put them in the refrigerator for up to 2 weeks. These cookies freeze very well also. Hints: It is not necessary to food process the oatmeal, but the cookies are less crumbly that way. This recipe is easily adjusted to fit your needs...it makes enough for 6 dogs so you may wish to make more or less accordingly. Play around with the amount of garlic and bouillon to your dog's taste, but be careful of the liquids--you don't want the dog treat mix to be soupy. In a large bowl, combine flour, powdered milk, garlic powder, salt and sugar. Cut in margarine. Mix in egg, then add liver powder. Add ice water until mixture forms a ball. Pat out dog treat dough 1/2" thick on a lightly oiled cookie sheet. Cut with any size cutter. Remove scraps and redo. Bake 30 min. Cool before serving. Combine turkey, garlic, cheese, parsley and mix well. Beat the eggs in a bowl and pour over turkey dog treat mixture. Add the flour, yeast, and oil. Stir until thoroughly mixed and all ingredients are coated. Drop into small lumps onto ungreased cookie sheet. Cook in a 350 degree oven for about 20 minutes, until brown and firm. Store the dog treats in the refrigerator. Combine first 4 ingredients; mix well. Dissolve bouillon cubes in boiling water and add bouillon to flour mixture. Mix to make stiff dough. Roll onto a floured surface. Cut out shapes with cookie cutters (or a drinking glass turned upside down can be used). Let the dog treats stand overnight to harden. Variations: use clear gravies from turkey, roast beef, etc. In place of bouillon cubes or clear soups. Crisp sausage bits could be used in place of bacon. Different spices could also be used (Italian, parsley, thyme, etc.). Be sure to check Foods to Avoid Feeding Your Dog before adding spices to make sure they are safe for your dog. Mix ingredients with a strong spoon; drop heaping tablespoonfuls onto a greased baking sheet. Bake in a 350 oven for 15 minutes. Turn off oven and leave dog treats on baking sheet in the oven overnight to dry out. Yield: about 4 dozen dog cookies. Mix all and scoop into bathroom cups. Place on tray and freeze overnight. Can add veggies, mashed bananas or substitute canned chicken for tuna. Grind oatmeal in processor to make a coarse flour. Set aside in small bowl. In food processor, whirr tuna with the oil, and water then add all the rest of ingredient. Pulse until mixture forms a ball, Pulse to knead for 2-3 minutes. Knead on floured surface till it forms a soft ball of dough. Roll out to a 1/8"-1/4" thickness. Cut into shapes. Bake on lightly greased cookie sheet, at 350 for 20-25 minutes. Cool completely. Remove bones, and return any beef marrow to the liquid, along with any meat that you can get off the bones. Cool the broth to room temperature. Pour liquid only into 2-4 ice cube trays. Chop up the marrow/meat/gristle into little bits, and put them into each section of the tray. Freeze solid. Drink the beer yourself, while your dog enjoys the doggie coolers. You are welcome to link to this webpage but please do not steal by posting my work on your website or blog.